Christine Caldwell, Senior Sales Consultant at Dorchester Travel, took a short trip to the glorious Greek island of Santorini. Famous for its whitewash buildings with blue domed roofs, this fantastic destination is perfect for various kinds of holidaymakers. We had a BA rep with us and were very lucky to be treated to the Business Lounge on the outbound leg and upgraded to Business class in both directions. The lounge was a nice touch as it was an early flight and it was great to get breakfast and a newspaper. It was bright with tables, comfortable armchairs and a wide choice of food and drinks to suit all tastes. The crew on both flights were very friendly and helpful. A hot meal was served which was very tasty. We stayed in the Andromeda Villas and Gold Suites in Imerovigli, about 2km from Fira, the capital. These are on the more picturesque, Caldera, side of the island so the hotel is built into the cliffs and most rooms are ‘cave rooms’. It is on several levels that are joined by steps and two small lifts are provided to reach most areas. The standard level of accommodation comes in various styles – some are duplex and some have cooking facilities. The rooms are a good size and light and airy. The terraces are communal except for suites, where they are private, and the views from everywhere are magical and feature beautiful sunsets. The Gold Suites are in a separate wing and have their own pool and bar and are of a higher standard than Andromeda. The restaurant was very good; the breakfast selection was excellent and even catered for the Japanese guests. Children are accepted by request, however, due to the many steps and low walls next to sheer drops, you would need to keep a close eye on the little ones at all times. We also had site visits to nine other hotels all over the island. Santorini is crescent-shaped and the most stunning hotels are on the Caldera side within the curve of the C. There are no beaches on this side and the hotels are mostly built into the cliff in traditional Santorini style, with lots of domes in blue and white. The resorts on the back of the crescent have beaches and are more like normal Greek villages. I preferred the hotels on the Caldera side despite the steepness. However, the El Greco Hotel is a good compromise. 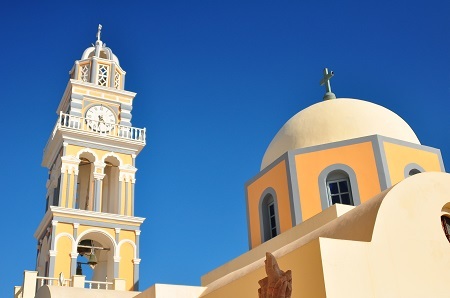 It is built on the flat, only a few minutes from Fira, and is more spread out. It has five good-sized pools and is child-friendly. As well as normal hotel rooms, studios with full kitchenettes are also available. For spa lovers, the Notos Therme in Vlychada, next to the marina, would be a good choice. It is built on a natural spa and bookings of seven nights or more are given three free spa treatments per person. The nicest hotel on the beach was the Santo Miramare in Perivolos – a traditionally built resort close to the beach and promenade with lots of bars and restaurants. It has three pools and charming staff. Cyplon were very generous and all meals and most drinks were included. As well as hotel inspections, several excursions were included. On the first day, we did a half-day Volcano and Hot springs tour. From Fira, we took the incline railway down to the harbour (donkey transport costs the same but takes a lot longer and didn’t look too comfortable or safe!) and boarded a motor yacht for the crossing to the volcano. We were then able to climb to the top for the amazing views. Back on the yacht, we sailed to the hot springs where we could swim before returning to Fira. We also visited Akrotiri – the Greek Pompeii – which has recently reopened. The site was completely buried by lava after the eruption of the volcano 3,600 years ago. However, people escaped after the earthquakes that preceded the eruption. It is a whole town with houses, shops and businesses, but most artefacts have been removed and transferred to various museums and only the buildings remain. It is a fascinating place. We had an evening drive to Oia (ee-ya) to see the sunset. Oia is very upmarket and is heaving every evening around the fortress from where you get the best views. It is very touristy with some extremely high-end shops and the sunset was no better that the view I got from my terrace. We also made a trip to Pyrgos, the highest village in Santorini. It is very picturesque with winding streets and a church at the top. On the way, we stopped at a monastery where we were able to hear the monks singing and buy their honey and other produce and on the way back we stopped at a vineyard for wine tasting and lunch. Due to the prevailing winds, the vines had grown flat on the ground. Just outside of Pyrgos is the hotel Carpe Diem. With only 10 suites, each with their own pool, it is very tranquil and romantic. I enjoyed all of it; it is really difficult to pick the best bit. As I enjoy history, I would have to say the trips to Akrotiri and Pyrgos were my favourite parts. Nothing. The trip was well-organised and went according to plan. I would recommend Santorini either to romantic, active couples or to people who like history and exploring. It would also suit sun worshippers who do not need a beach. The island may suit some families who are not looking for kids clubs, staying either at the El Greco or at hotels on the eastern coast. Most of the reps are German but all speak faultless English and are very knowledgeable and helpful. If you would like to experience Santorini, either as part of a cruise or a land stay, we can plan your perfect trip. Drop by your local Fred. Olsen Travel branch or call any of our travel shops in Suffolk, Norfolk, Essex and on the south coast.